The cat is out of the bag. 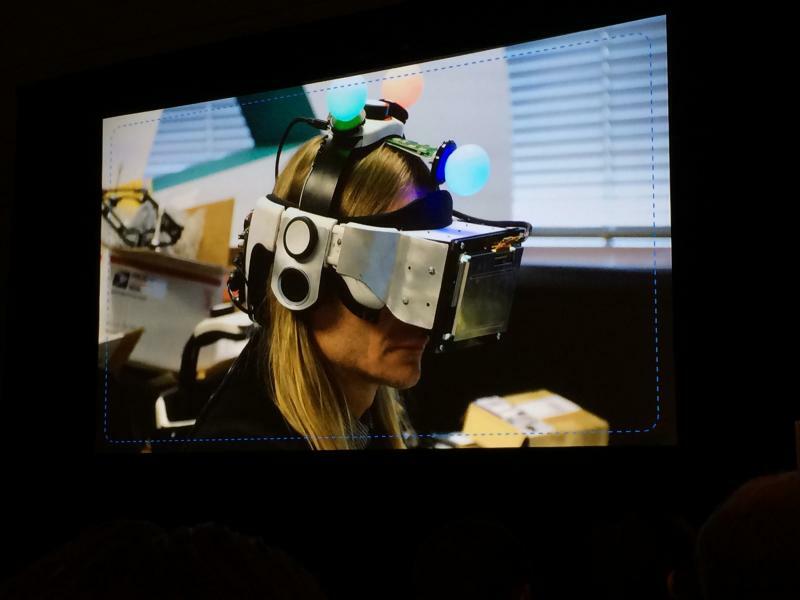 As we reported yesterday afternoon, Sony announced their PlayStation 4 VR head mounted display, “Project Morpheus” at GDC. Onlookers weren’t allowed very close to the unit, and I had plenty of heads and hands in most of my captures, but I was able to grab a few ultra high-res photos of the HMD for your viewing pleasure. 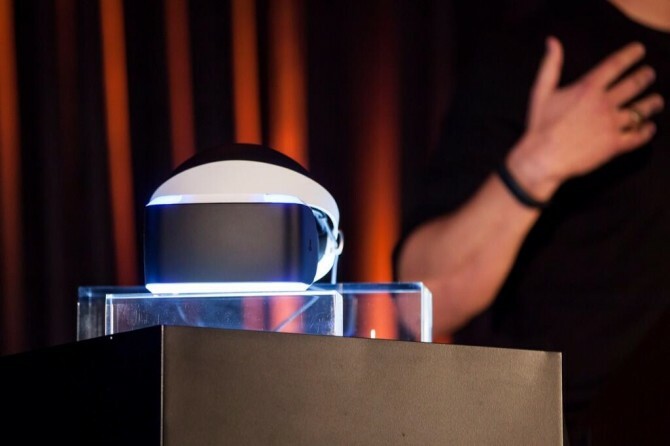 The first few shots are of Project Morpheus from a few different angles, and the next few are some cropped shots that show the HMD up close and personal and Sony’s test area for Project Morpheus. The first set is a selection of images showing the display from a few angles with SCE Worldwide Studios president Shuhei Yoshida, Richard Marks, and Anton Mikhailov during the Q&A session that followed the initial reveal of Project Morpheus. As you can see, the display is rather large at this time. It’s not necessarily the final unit, but it’s larger than we’d expected. Sony claims the unit won’t cause fatigue over long play sessions. We’ll post our early impressions of Project Morpheus and how it could change the future of console gaming tomorrow after our hands-on session. During the presentation at the Game Developers Conference Sony Computer Entertainment mentioned just a few demos for Project Morpheus, but didn’t specify any actual games in development, saying that its studios are “experimenting” with the technology. If proven true, that would definitely be a stellar line-up. 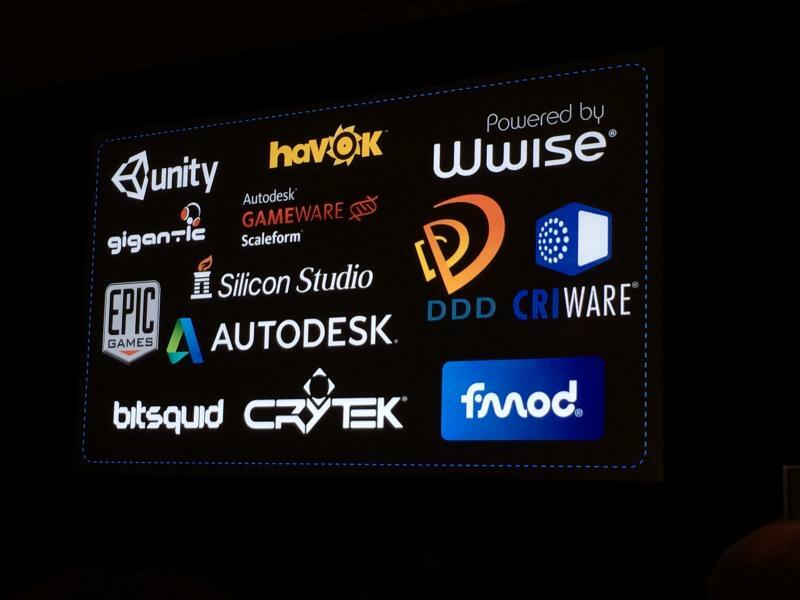 During the conference it was indeed mentioned that driving games are one of the most fitting applications for the technology, so the list sounds quite credible, even if we should take it with a grain of salt, as usual. Interestingly enough, GameTrailers host Geoff Keighley also mentioned that the newly announced headset apparently sports a better visual fidelity than the Oculus Rift. 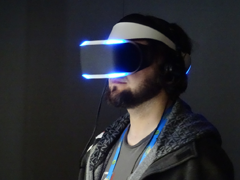 Developers who have used Project Morpheus tell me the fidelity of the image and experience is superior to Oculus Rift. Having thoroughly enjoyed the Rift when I had the chance to test it, I can’t say the revelation doesn’t intrigue me. Considering Sony’s expertise it’s not too surprising, but we’ll have to wait and see until we’ll have that 5 inches LCD panel in front of our own eyes to judge. Unfortunately, the company did not have any examples of titles that might use the device with such modes. It was later confirmed that only a single headset will run on the PS4 at any one time, but it was suggested that one player can be using the television while another uses the VR headset for a competitive multiplayer experience. Perhaps this could also translate to a Wii U-like second screen application for videogames? Multiplayer compatibility will hopefully help the devices chances of being integrated into titles like Call of Duty and Battlefield. 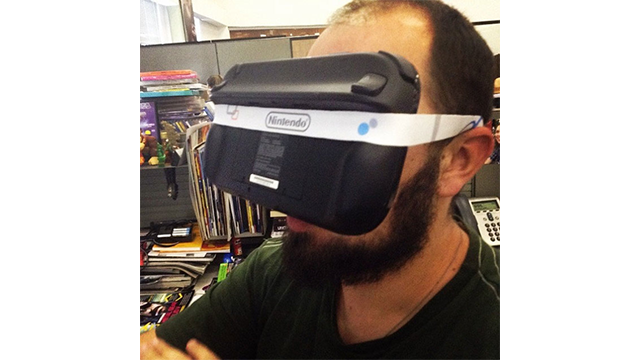 VRFocus will track the progress of the headset and any possible multiplayer titles and report back with the latest. It’s real. After months of teasing and rumors Sony Computer Entertainment finally announced officially the virtual reality headset engineered for the Playstation 4. The headset has been announced by SCE Worldwide Studios President Shuhei Yoshida during the “Driving the Future of Innovation at Sony Computer Entertainment” panel at Game Developers Conference. According to Yoshida-san the VR headset, named Project Morpheus, has been in the works at SCE since 2010, starting with experiments executed by attaching a PlayStation Move controller to the headset itself, and then with further iterations. The name “Project Morpheus” evokes the god of dreams, and symbolizes the fact that the headset should offer a dreamlike experience. Yoshida-san also mentioned that the prorotype shown today isn’t final, and will see more iterations and evolution. That said, it’ll be already playable at the Game Developers Conference (GDC) show floor starting tomorrow. 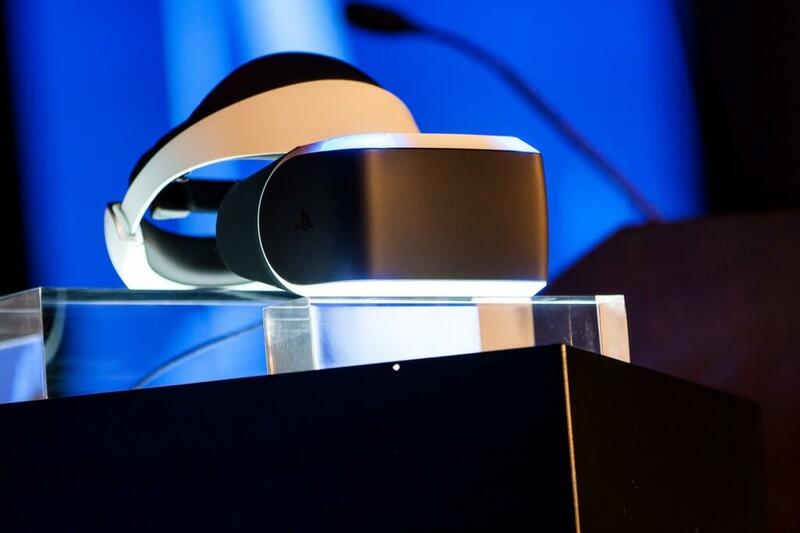 Sony has selected GDC to introduce Project Morpheus as it’s a developer-oriented show, and the current focus is to invite developers to create games for it; which explains why the device is being presented while it’s still in the prototype phase. Senior Director Richard Marks also took the stage mentioning that he’s working on a project with NASA called “Mars Demo,” aimed to give the impression of really standing on the red planet. He continued by saying that the six principles of Virtual Reality are Sight, Sound, Tracking, Control, Ease of Use and Content, and that nailing those areas will allow Sony to open the technology to the mass market. Sight requires a high resolution, high framerate display and specialized optics. 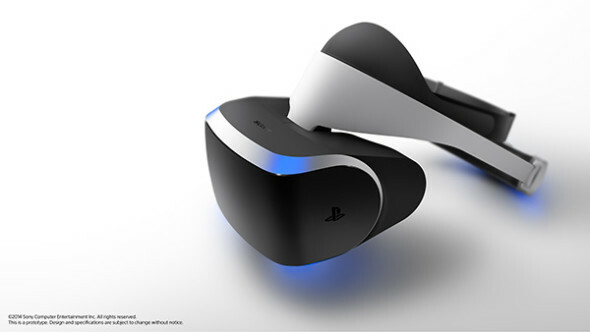 The power of the PS4 will also be essential to render the world of virtual reality. Sound is essential to achieve the feeling of “presence” and Sony has a great heritage in sound design. 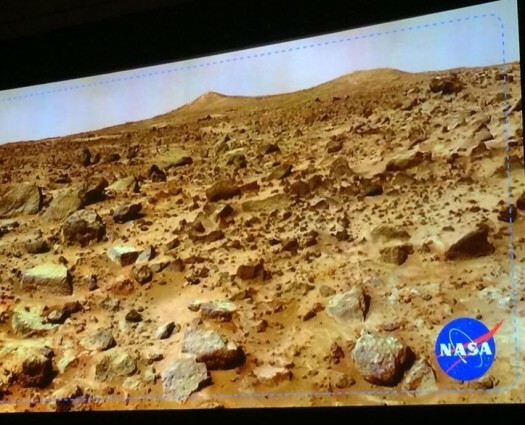 Tracking is what allows virtual reality to be like a personal theater on your head. The camera is essential to achieve that, and the PS Move’s technology is being used to help with it. Control is also important, and that’s why the DualShock 4′s sensor and light bar will be used in conjunction with Morpheus. Ease of use is the next step, and users will be able to pick the headset up and use it with no issue. Finally, content will be a focus, not only from Sony’s internal studios, but also from external developers. Unity, Havok, Wwise, Gigantic, Autodesk Gameware, Criware, DDD, Silicon Studio, Epic Games, Bitsquid and Crytek will be taking part in Project Morpheus. Marks also mentioned that virtual reality doesn’t necessarily need to be applied only to first person games, but third person ones are also possible. Driving games are also a great application, and virtual reality can be applied both to the steering wheel and to the pedals. Virtual tourism is a possibility, but ultimately games are still the best way to express and exploit VR technology. You normally don’t imagine the Virtual reality experience to be social, but Sony envisions it as such, both with online and couch multiplayer. You can also project the image on your TV so that others can see what you’re doing, also enabling interesting asynchronous multiplayer experience. The current devkit supports 1080p (1920xRGBx1080, 960xRGBx1080 per eye) resolution and a 90 degrees field of view. Tracking supports forward prediction. Position and rotating head tracking has the following specs: 1000HZ frequency, 3 Meter Working Volume, Full 360 Degrees rotation. Eye tracking is being researched. The panel is a 5 inches LCD and the headset is equipped with an accelerometer and a gyroscope. It connects to the PS4 via USB and HDMI. A “Processor unit” is also included in the package. True spatial sound (3D audio), synthesized by simulating the human ear is also supported. The headset manages to simulate sound coming from above and below the player. The headset will be highly adjustable, comfortable for prolonged use, will support custom headphones and wearing glasses, and will place most of the weight on your head and not on your nose. 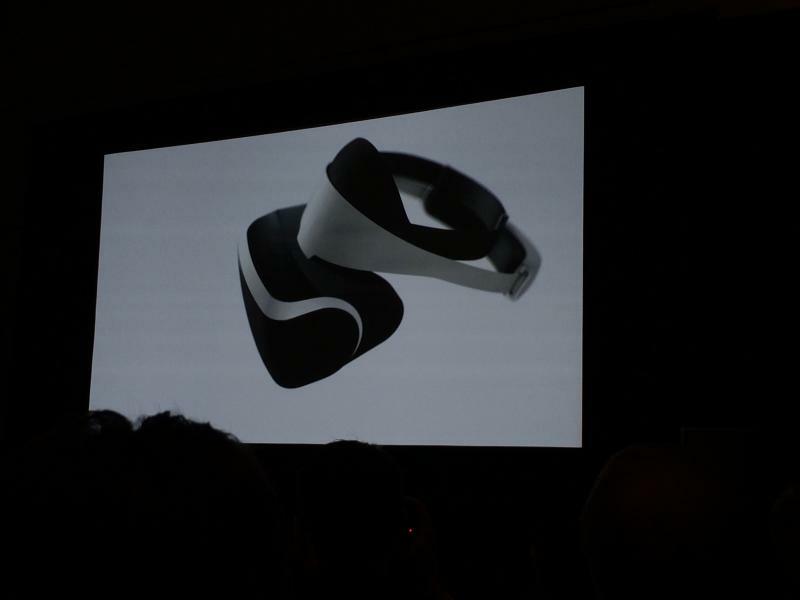 The current prototype is wired, but Sony is investigating other solutions. The current demos are Thief from Square Enix, EVE Valkyrie from CCP Games, The Castle and The Deep by Sony London Studio. Other Sony development teams are experimenting with the technology. PRIDE OF LONDON - CHELSEA F.C. 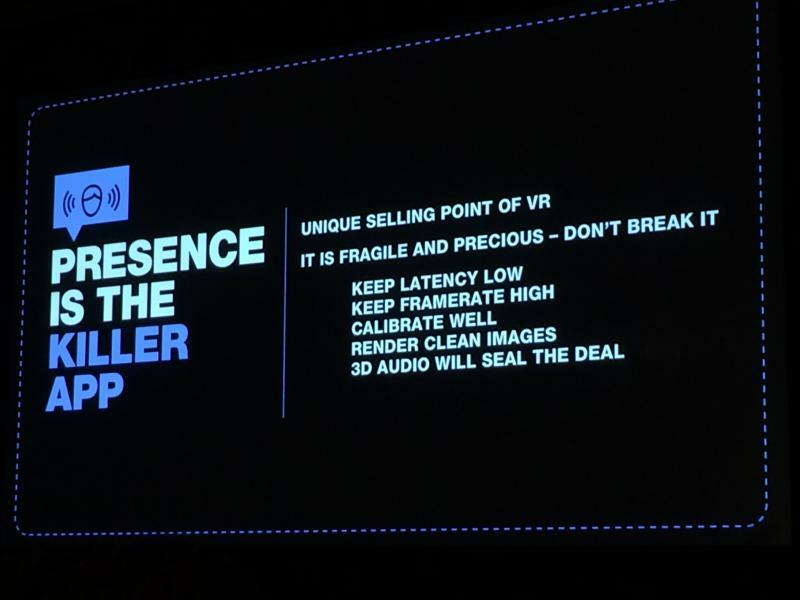 Industry insider Ahsan Rasheed has been talking about Project Morpheus for a while, and since the new VR headset has finally been announced and the gag has been removed, today he’s been sharing a lot of the information he’s been given by his usually reliable sources. One final thing I’ve heard over the last few months and things can change so don’t hold me to this forever. Morpheus is targeting a $249-299 price point. And yes, I have told this to @roboplato many moons ago before this thing was even a thing. Morpheus will include camera I’ve heard. The product when launched will have everything ready to go. BTW this isn’t Move or EyeToy, Sony is very serious and major internal teams are doubling down. This isn’t a novelty. Sony wants to prove to gamers that PlayStation is gaming. Internal teams are working on things that are absolutely fantastic. Such a low price point for a virtual reality headset sounds almost crazy, especially considering that the new version of the Oculus Rift will cost $350 and Sony’s own HMZ-T3W Head Mounted Display is priced at $1,000, but many would have said the same about the PS4 being sold at $399 before its price was actually announced last June. That said, we definitely should consider this just a rumor for the moment. We’ll have to wait and see if Sony will manage to sell the Morpheus at such a bargain price. One thing is for sure, that kind of affordability would definitely drive adoption, and technology like Morpheus lives or dies on its adoption by customers. If Sony wants virtual reality to really take off, they’ll have to keep the price down, or it’ll end like stereoscopic 3D did during last generation. 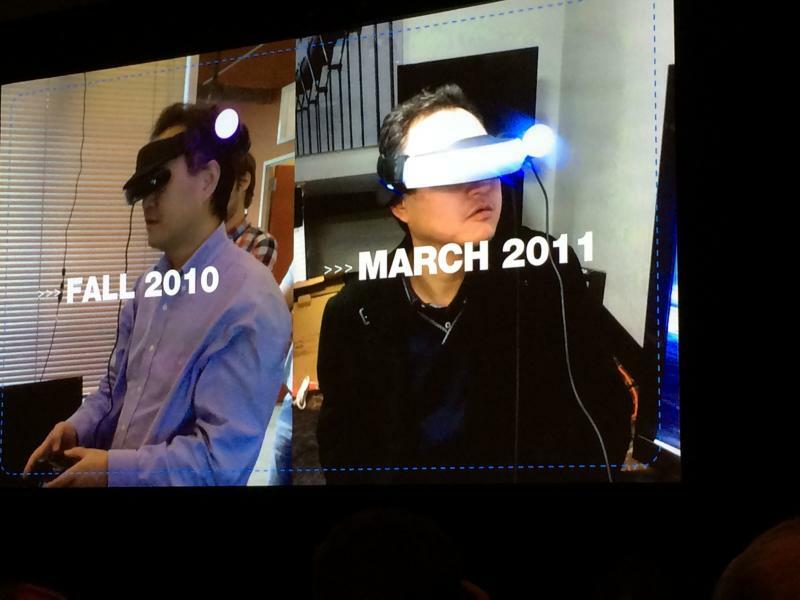 Project Morpheus! 9 things you need to know about PlayStation 4's VR headset! 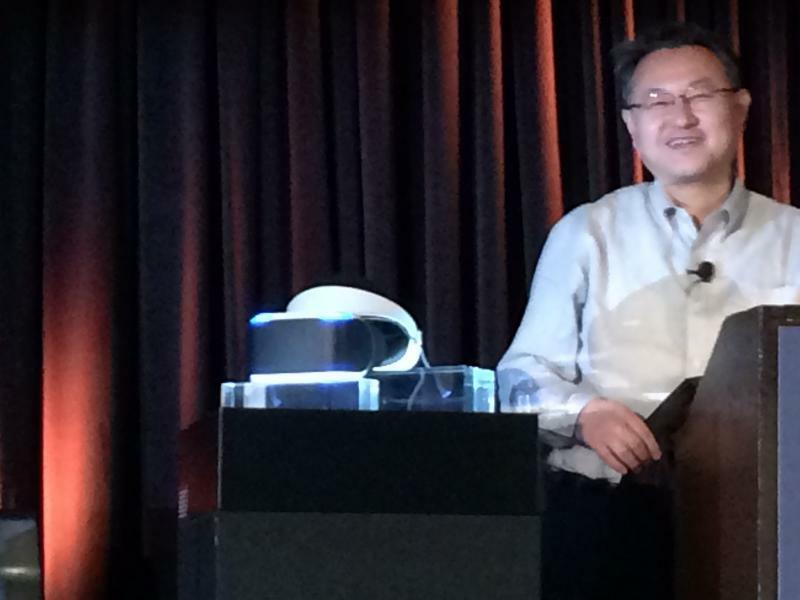 Here's everything we know about Project Morpheus, Sony's new VR headset for PS4. Virtual Reality is coming to PlayStation 4! PlayStation Access TV brings you the latest UK PS3, PS4 and PSVita news, events and goodies each week, giving you unprecedented access to the biggest games and events on PlayStation. XD 你知唔知 Virtual boy 玩乜?